Asthma is a heterogeneous disease, with individual patients presenting with different symptoms, pathology and underlying disease mechanisms, termed “phenotypes”. Sputum (produced spontaneously or induced with hypertonic or isotonic saline solutions) can be used to phenotype the type of airway inflammation that is present in patients with severe asthma (e.g. 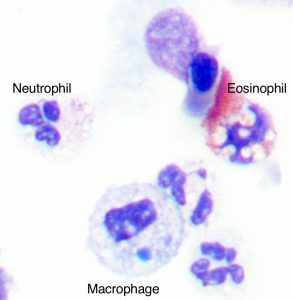 eosinophilic, neutrophilic, mixed or paucigranulocytic (Simpson et al. 2006)). Sputum eosinophil numbers correlate somewhat to FeNO and blood eosinophil levels (Wagener et al. 2015). A person’s asthma control and their rate of exacerbation improve when inhaled corticosteroid treatment is guided by sputum eosinophil levels (Green et al. 2002). NOTE: sputum induction, preparation and analysis require specialized staff and is time-consuming. A trained assistant is required to administer nebulised solutions, encourage the patient to expectorate, select appropriate samples (plugs); a trained laboratory technician is required to prepare the specimen for cytology, stain the specimen, assess specimen quality and cell viability and to count cells. Sputum may be useful for microbiological and cytological examinations to exclude other causes of respiratory symptoms. Sputum photo provided by Dr. Michael Fricker, University of Newcastle. FeNO is a relatively easy test to perform (after preliminary training) and takes very little time. An ATS Clinical Practice Guideline is available for the interpretation of FeNO for clinical applications (Dweik et al. 2011). FeNO correlates with sputum eosinophilia (Wagener et al. 2015) and can be used to identify a Type 2 inflammatory phenotype, even in the presence of other functional abnormalities such as fixed airflow obstruction. However, there is a need for cut-points (Vestergaard et al. 2014). FeNO is influenced by a number of variables including smoking, sinus disease and diet, as well as allergic rhinitis and acute viral infection (Taylor et al. 2006). FeNO may contribute to a useful treatment algorithm in adults or children, and may be useful in a subset with more severe asthma and frequent exacerbations (Essat et al. 2016, Petsky et al. 2016a, Petsky et al. 2016b). Analysers to measure FeNO vary in costs for the device and ongoing maintenance and consumables. Increased initial outlay often means reduced yearly running costs. The most cost-effective device will depend on the expected number of tests/year. There may be differences in measurements between devices. This should be a consideration when considering making management changes, as the main reason for using FeNO measurement is to help guide treatment changes. As with any laboratory device, biological controls as part of a standard Quality Assurance program is desirable, to detect progressive bias/error in measurements and to determine day-to-day variability, which will provide an estimate of the magnitude of a significant change in FeNO level. Biomarkers are molecules that can be used to identify specific pathways that underlie disease in an individual. 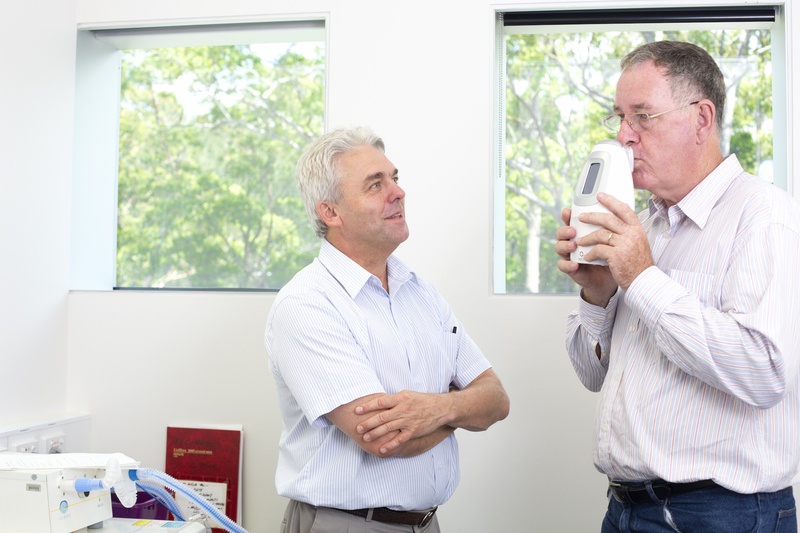 A number of biomarkers have been proposed for asthma phenotyping (Fricker et al. 2017). The hope is that biomarkers can be assessed in samples that can be readily accessed clinically (e.g. blood, exhaled breath or sputum), to provide an understanding of the specific mechanisms underlying disease and assist with selection of individuals likely to respond to targeted therapy. Atopy can be assessed by allergen skin prick testing and can provide insight into specific disease triggers. The fraction of exhaled nitric oxide (FeNO) in breath can be used as a surrogate measure of eosinophilic inflammation and has a reasonable correlation to sputum eosinophilia (Berry et al. 2005). Similarly, peripheral blood eosinophil counts can be assessed as a measure of systemic eosinophilic inflammation. Circulating periostin levels have also been proposed as a biomarker of allergic disease (Conway et al. 2014). These biomarkers can be used to identify people with allergic and/or eosinophilic disease, who may respond to targeted anti-IgE and/or anti-IL-5 therapies. At present, limited approaches are currently available to dissect neutrophilic or non-Type-2 disease phenotypes.